Personalized Couple Matching T-shirt Set for Honeymoon and Wedding Photo Shooting. All Shirts printed with High-Quality Digital printers and cured with a solution to last forever. Please wash all shirts before wearing! We always recommend cold wash inside out. All shirts are 5.3 oz., pre-shrunk 100% cotton expect Deep Heater is 50/50 cotton/polyester. Customized Matching Shirts will be ready for shipping just in 1 business day! To customize your shirts, please choose your size and colors then click " Customize Now " section on your top right then fill the customization page with requested information such as last name or wedding date! All our shirts are made to order. 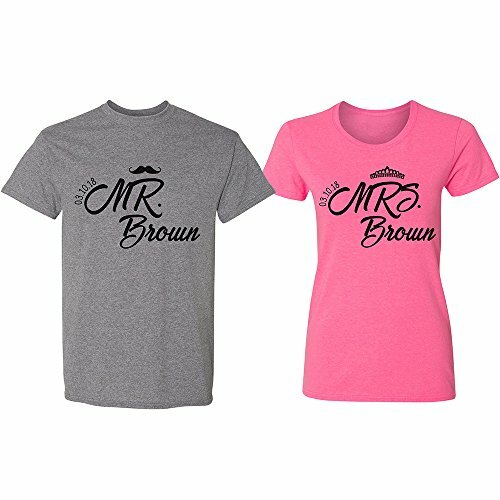 We will prepare your couple matching shirt set after you placed your order, with the customization details you provided that means those shirts are uniquely made for you by our lovely crew! Please make it sure that sizes are correct, you picked the color you love, and the customization information is accurate! We do NOT use any Decals or Stickers to personalize your shirts, all designs directly printed on the shirts with special printing system. All shirts will be ready in 24 hours, and you will receive a valid tracking number as soon as we process your order! Shipping usually takes 2-5 business days depends on how far you are! We proudly design and print your shirt in California, USA. Please check our store front for more Couple Matching gifts!! Such as coffee mugs, Tumblers, Flask Sets, and Champagne Flutes. If you have any questions about this product by Personalized Favors, contact us by completing and submitting the form below. If you are looking for a specif part number, please include it with your message.